By placing an order via our website (www.scratchycats.com), you are offering to purchase a product on and subject to the following terms and conditions. All orders are subject to availability of materials and confirmation of the order price. Dispatch times may vary according to availability of materials and any guarantees or representations made as to delivery times are subject to any delays resulting from postal delays or other circumstances which we will not be responsible. Please see our information page for further information. In order to purchase from ScratchyCats you must be over 18 years of age. ScratchyCats retains the right to refuse any request made by you. If your order is accepted we will inform you by email. When placing an order you undertake that all details you provide to us are true and accurate, that you are an authorized user of the credit or debit card, or bank account used to place your order and that there are sufficient funds to cover the cost of the goods. All prices advertised are subject to changes. Whilst we try and ensure that all details, descriptions and prices which appear on this website are accurate, errors may occur. If we discover an error in the price of any goods which you have ordered we will inform you of this as soon as possible and give you the option of reconfirming your order at the correct price or cancelling it. If we are unable to contact you we will treat the order as cancelled. If you cancel within 24 hours of placing the order and you have already paid for the goods, you will receive a full refund. Cancellations after 24 hours may incur a cancellation charge. Delivery costs will be charged in addition; such additional charges are clearly displayed where applicable and included in the Total. 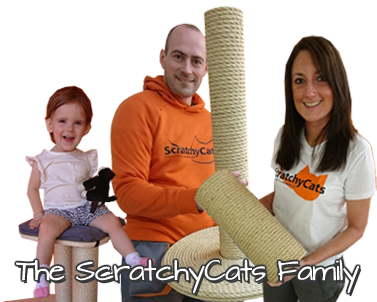 At ScratchyCats, we only sell to our private customers unless prior arrangements have been made. It is not in our business model to sell items in bulk quantities to other retailers. We reserve the right to refuse or cancel any orders which we suspect are beyond the requirements for an individual. If you have any questions on this matter, or wish to consult us before making a large purchase, or have a wholesale enquiry please contact us.